Serves 6 to 8 people. 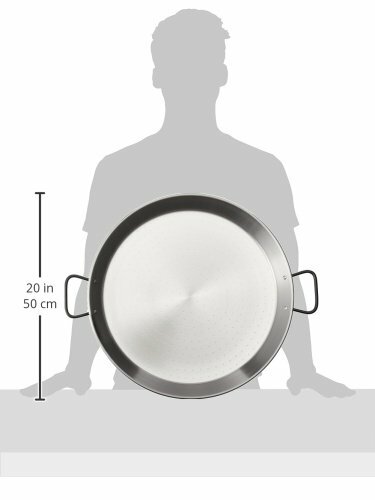 This 18" (45 cm) pata negra paella pan will fit over two closely spaced standard burners, or sometimes over one and a half burners. It also fits in some home ovens (measure first!) and can be used on all types of grills. Pata Negra is a professional quality paella pan made from an extra-thick and heavy-duty grade of carbon steel. It's a good choice for restaurant kitchens, or for home cooks who expect to give their pan a good workout. As with any carbon steel pans, these pans requires a bit of care: you must dry the pan right after washing it and then rub the inside with a little vegetable oil to prevent rusting. If the pan does ever rust, a few passes with steel wool takes it right off. The pan comes with an informative pamphlet with each pan, which contains two recipes, our tips for perfect paella, and care instructions. PAN DIMENSIONS: Bottom Diameter: 16", Top Diameter: 18.5", Diameter w/ handles: 22.5", Depth (outside): 2". Professional grade carbon steel is extra thick and durable and conducts heat well; Requires a bit of maintenance after washing. Can be used on a paella burner or a gas or charcoal grill. Ideal for serving 5 to 8 people. Informative pamphlet with each pan, which contains two recipes and tips for perfect paella.